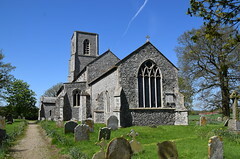 There are so many medieval churches in the area between Aylsham and Cromer that it seems impossible that any of them can be remote, but many of them are, and St Margaret is one of them. 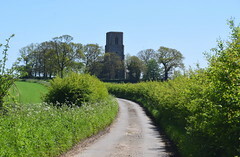 Actually only a few fields away from St Giles at Colby, there is no direct route between them, and in general all the roads around here twist and turn in a convoluted way. They were designed for access to medieval fields, not for getting from one place to another. 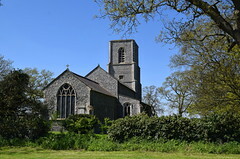 When I first wrote about the church in 2005 I noted that the rather stark flat-topped tower rises above a boiling of trees in the otherwise gently rolling expanse of hedgeless potato fields. Coming this same way again in 2018, the lane was now high-hedged, and it was impossible to tell what was growing in the fields. The tower was unfinished on the eve of the Reformation; Pevsner notes a bequest to cover it of 1523, but this never happened. 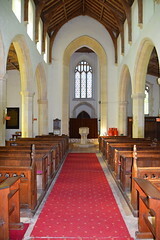 The massing of the tower, nave, aisles and chancel make this appear a big church, but it isn't really. 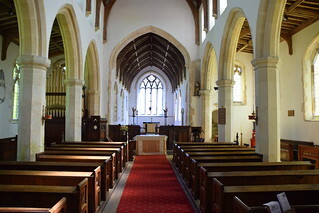 The creamy light from the clerestory and nave windows creates a sense of openness, and there are some quirky features like the four riddle posts from a Sarum screen, their gilded angels still in place, two in situ and the other two reset at the far end of the chancel beside the rood screen dado. They serve as candle holders, but look most odd. 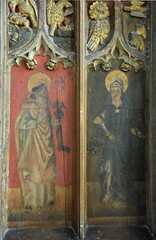 The great treasure of St Margaret is the rood screen, and the hands that made it included that of the master carver at Aylsham. 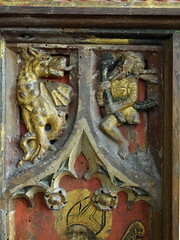 Although eight of the figures on the dado panels survive, the greatest interest here is in the carved spandrels. 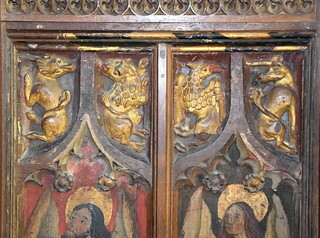 In pairs, they depict fables, comic allegories, marvellous beasts and Christian symbols. In one pair, a wild man with a club rushes at a dragon. 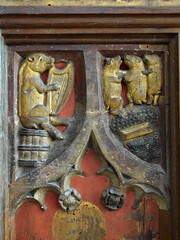 On another, a pig sits on a barrel playing a harp while three smaller pigs dance beside a trough. Elsewhere, an eagle catches a rabbit while its luckier companion escapes into a burrow. 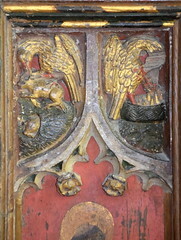 On the adjacent carving, a pelican pecks its chest to feed its young with blood. 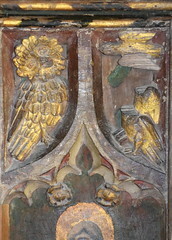 An eagle bites the horn of a unicorn which has poked through the frame of the screen from the adjacent panel. 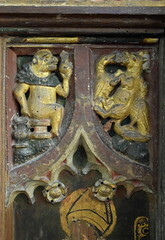 The strangest and most vulgar depicts an ape in a friar's habit sitting on a stool examining its own urine, a comment on the contemplative habits of friars, while a fox defecates as it is attacked by geese, certainly meant to represent listeners turning on an unwelcome itinerant preacher. The sequence of eight figures on the dado panels is an odd one. 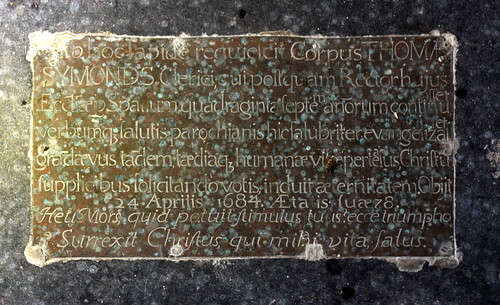 On the north side are the four Latin Doctors, Ambrose, Augustine, Gregory and Jerome. 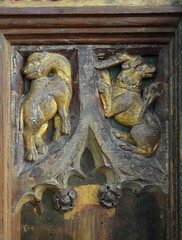 Jerome has a little lion for company, and across the entrance to the chancel two more little animals accompany their saints, the bull of St Luke and the eagle of St John. These two Evangelists are repainted, and, oddly, they both have wings. Finally, there are two more obscure figures. One is the locally popular Sir John Schorne conjuring the devil into a boot, and the last is a figure in black, lifting his robe to reveal his armour, a bird perched on his arm. Obviously, it seems odd that there are only two of the four evangelists, while two of the eight Saints are little-known in comparison with the other six. 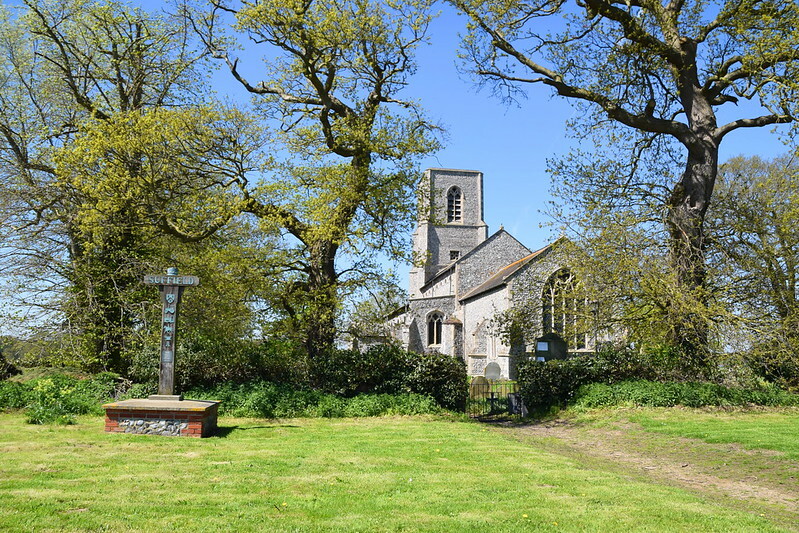 The eighth figure is variously identified as the French St Julian the Hospitaller, to whom a church is dedicated in Norwich, and the obscure Englishman St Jeron. 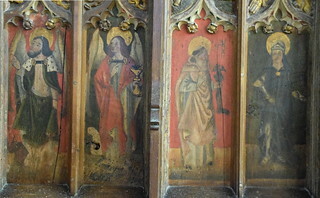 It is quite likely that all these panels all came from here originally, but that they have been rearranged and reset (there are also two blank panels of modern wood either side). There would once have been more, certainly including the other two evangelists. 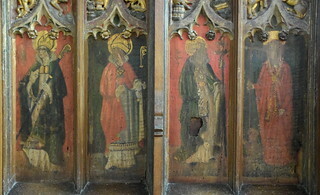 The four Latin Doctors may well have been on the roodscreen gates, as is common in Norfolk. 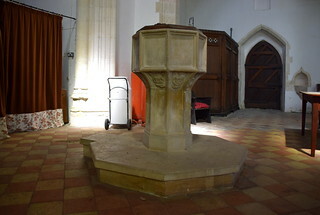 There is a nice double piscina up in the chancel, and a couple of curiosities; the panels of the font are cemented over - I wonder what might be underneath them? 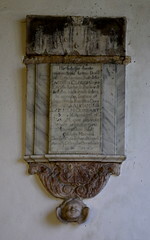 - and an old memorial peeps its head above the 19th century panelling of the chancel. 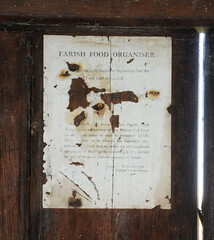 The most curious survival of all is pasted to the outer door of the porch, the remains of an official poster from the Second World War announcing the name of the Parish Food Organiser, authorised by the Ministry of Food to make all arrangements necessary for feeding the community if it should be cut off from its normal sources of supply. The parish food organiser was just one of many roles required as part of the civil defence plan in case of German invasion. These posters were supposed to be put up in every parish in the land, and perhaps it is appropriate that if it has survived anywhere it should be in such a remote spot as this.